2 Boneless Duck Breasts weighing at least 18 ounces each. (That's a total of 4 lobes at 9 oz. each.) Shipped frozen. 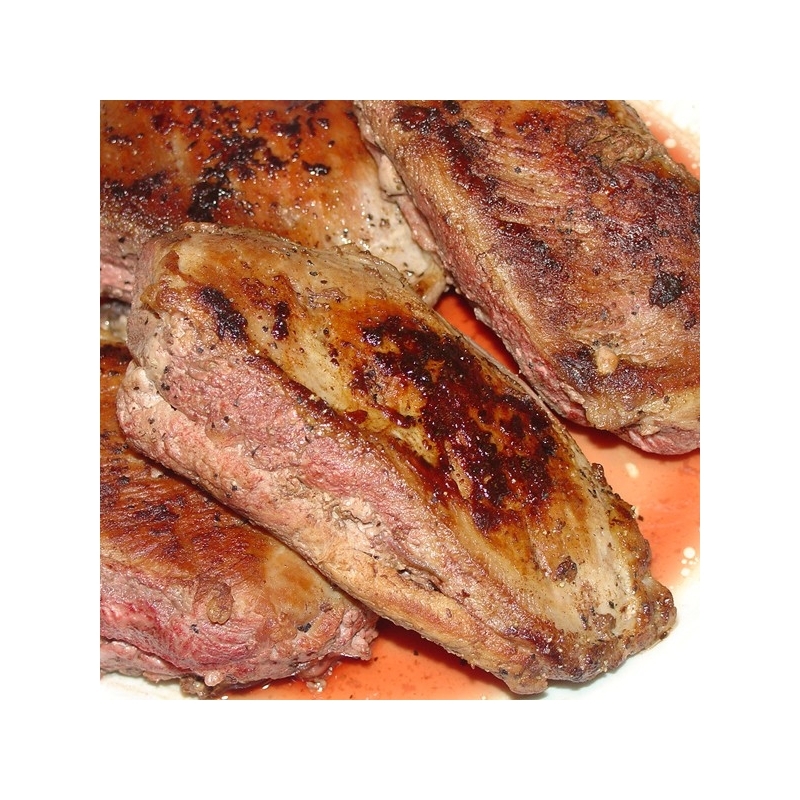 Boneless Duck Breast- This is where you get to experience the results of our farming. A pure Pekin breed original to the Ming Dynasty...a stress-free environment...no hormones...no additives...true sustainability. The finished product is a succulent duck breast with the perfect meat-to-fat ratio. 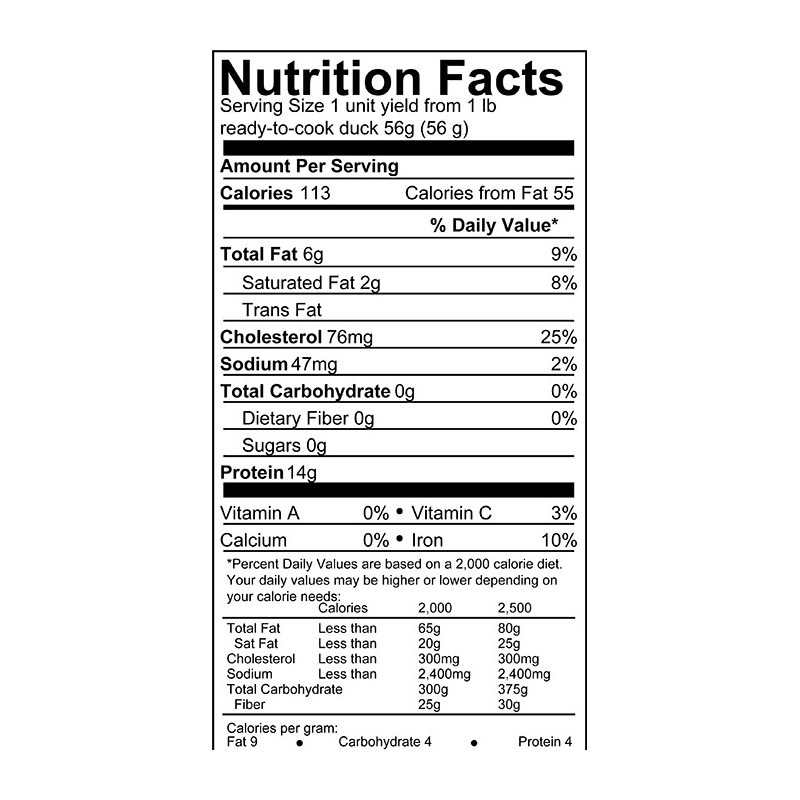 Duck Breasts can be cooked similar to that of any kind of red meat, no matter if it is pan fried, grilled, preserved (confit), or roasted. Regardless of the recipe, Pekin Duck Breast is at its very best whenever served medium rare. 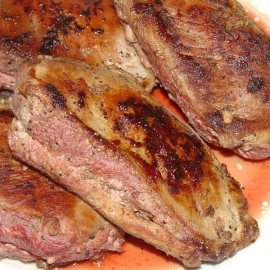 Pan Fried Boneless Duck Breast If frozen, thaw in the refrigerator overnight. Make incisions through the skin in a crosswise sequence with out cutting into the meat. Position breast skin side down in a heated skillet over medium-high heat. Sear for 3 to 4 minutes. Decrease temperature to medium, flip and cook 6 to 8 minutes. Remove the duck breast from the baking pan and let it sit three to four minutes prior to slicing. Barbecued Duck Breast If frozen, thaw in the fridge overnight. Heat the barbecue by turning on only one burner at highest heat. Use a sharp knife to cut incisions through the skin, be mindful not to penetrate into the meat. The incisions preferably should be about 3/4" (2 cm) apart and in a crosswise sequence (checker plate pattern). This has a tendency to assist fat rendering and grill the breast evenly. Broil the duck breast at direct heat, with the skin side on the grill, for 1-1/2 minutes and flip once for another 1-1/2 minutes. Continue cooking at indirect heat, closed cover, skin side on the grill for 8 to 10 minutes. Finish up the at direct heat, open cover, meat on the grill, for 2 to 4 minutes. You want the breast meat to be grilled pink with an internal temperature of 160°F (70°C).